The Bombay Stock Exchange’s sensitive index went into free fall today after foreign institutional investors encashed their holdings in keeping with bearish sentiment across the globe, analysts said. Reflecting the differences with elder brother Mukesh on buyback of shares by flagship company Reliance Industries, Anil Ambani today said he had proposed that 12 per cent equity in RIL held by the Petroleum Trust and four companies be distributed free of cost among the existing shareholders. Mobile telephony in the Northern region comprising Punjab, Haryana, Himachal Pradesh and Chandigarh has turned more competitive with Tata Teleservices Ltd launching its services in a market that has six major telecom players already jostling for a market share. Punjab Chief Minister Amarinder Singh discusses a point with Mr Ajay Pandey, President, Tata Teleservices, at the launch of its telecom services in the northern region at Chandigarh on Wednesday. — A Tribune photograph. CADD Centre Training Services Private Limited, the training arm of a 16-year old $ 6 million CADD Centre Group, plans to start its operations from China soon after the Chinese New Year (February 9). The Indian centre, which is an arm of the US-based Autodesk Inc., popular for AutoCAD Software, has its headquarters in Chennai. In a move to control the rising prices of sugar, Union Agriculture Minister Sharad Pawar is slated to meet Prime Minister Dr Manmohan Singh tomorrow to discuss various measures to control the situation. State governments today endorsed a “white paper” on Value Added Taxation (Vat) regime, which is scheduled to come into force from April 2005. LG Electronics India Pvt. Ltd (LGEIL) today launched the first direct to home (DTH) ready TV set in India that will enable the customers to watch all the “free to air” channels of Doordarshan. The company is also likely to bring a public issue in the market. New Delhi/Chandigarh, January 5 The State Bank of India has contributed Rs 10 crore to the Prime Minister’s Calamity Relief Fund for rehabilitation of tsunami victims. SBI Chairman A K Purwar presented the cheque to Prime Minister Manmohan Singh here, a statement said today. Maruti Udyog Ltd today announced a nominal hike in the prices of its models, ranging between Rs 2,000 and Rs 3,000, due to an increase in input costs, and said it will soon revise the price of its top-selling car Maruti 800. The Sensex plunged by 316 points to an intra-day low of 6335 today afternoon before picking up in the last hour of trading to close 192 points at 6,458 points or 2.89 per cent lower than the previous close. All major sectors took the brunt of bear hammering with metal, banking and technology shares rapidly losing value. However brokers dismissed panic settling in and were hopeful of the bulls returning in the coming trading sessions. The Nifty too was not immune to today’s bear hug and it fell 113 points to an intra-day low of 1991. It, however, closed higher at 2032 points, down 71 points or 3.4 per cent. According to brokers here, all major international markets were hammered today. A pall of gloom descended on the bourses after a crash on the London Metal Exchange. Hammering of stocks on Wall Street too took its toll here. Ispat Industries was down nearly 8 per cent while Essar Steel, JVSL and Sal Steel all shed between 6 and 7 per cent each. Jisco, Jindal Steel, Sesa Goa, Tisco and Sail also lost over 4 per cent each and Saw Pipes plunged by over 8 per cent. Nalco and Hindalco were down 10 and 4 per cent, respectively. Today’s big losers were expectedly Reliance scrips. IPCL lost 5 per cent while Reliance Energy fell by over 2.5 per cent. However, the flagship Reliance Industries Ltd ended slightly lower. Other losers today were Balaji Telefilms, Asian Hotels, Essar Steel, Morepen Labs, Saw Pipes, Tata Teleservices and Hero Honda. Tech majors like Wipro lost 6 per cent, while Satyam was down 5 per cent. However Infosys and NIIT were down 2 per cent each and TCS lost about a per cent. Mid-caps saw sharper falls. Polaris was down over 6 per cent while Tata Elxsi shed 7 per cent. In the energy sector, MRPL, Gail and Essar Oil were down nearly 7 per cent each. ONGC, IOC, IBP and Bongaigaon Refinery were down over 3 per cent each and HPCL was down more than 5 per cent. The RIL Board, however, rallied behind Chairman Mukesh and passed the buyback proposal ignoring Anil’s suggestions. The issuance of this equity as a free bonus would also be in line with founder Chairman Dhirubhai’s announcement at the 1997 Annual General Meeting that RIL would have a continuous programme of bonus issue, generally once in five years. RIL shareholders were issued bonus share in 1997. The Indian Petrochemicals Corporation Limited (IPCL) board meet this month-end will decide on the resignation of its Vice- Chairman and Director Anil Ambani. IPCL announced the resignation of Anil from the board on Monday and said he had tendered his resignation through a letter addressed to his brother Mukesh Ambani, who is the Chairman of the corporation. IPCL is a group company of Reliance Industries which had acquired the erstwhile state-owned corporation through bidding process in the Government’s disinvestments programme and holds around 46 per cent stake in the IPCL. Reliance has bagged a deep-sea oil and gas block in Gulf of Oman and is looking for oil assets in Qatar, Iran and Saudi Arabia. “We have got one deep water block in Oman. The block is believed to hold crude oil and condensate reserves,” a top company official said here. Addressing mediapersons here today, Mr Ajay Pandey, President, Tata Teleservices, said the company would be launching its CDMA-based services in 65 towns across these states by making an investment of Rs 600 crore by March in the first phase. These would cover all major towns in the region, including Chandigarh, Ludhiana, Jalandhar, Amritsar, Patiala, Ambala, Karnal, Panipat, Sonepat and Shimla, besides key highways and rail routes. Its bouquet of services includes mobile services, fixed wireless phones (FWP), public booth telephony and wireline services, besides a host of other value-added services like voice portal, roaming, post-paid Internet services etc. The company would offer its services under the brand name Tata Indicom and would offer its post-paid subscribers free Internet usage and SMS till February 28, free local Tata-to-Tata calls till April 30. And for its pre-paid subscribers it would offer full talk time value and one second pulse billing facility as part of its True Paid offer. “Our services would be available to subscribers across 1,000 cities across India by the end of March, except the states of Jammu and Kashmir and the North East,” said Mr Pandey.. The company was also setting up a 600-seater BPO call centre at Mohali that would start functioning by month-end. And with this, they would be offering direct and indirect employment to over 5,000 persons in Punjab and almost the same number in the other two states. It has set up over 60 true value shops, exclusive outlets offering its pre-paid services, of these 26 would be in this region. 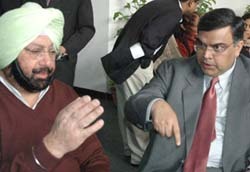 Formally launching the services at the CII complex here, Punjab Chief Minister Amarinder Singh said there is tremendous potential for the growth of telecom services in the rural sector of Punjab where most of the key players in this field have not yet made their presence up to the mark and tele-density till date is just about 5 per cent. CADD Centre Training Services Private Limited, the training arm of a 16-year old $ 6 million CADD Centre Group, plans to start its operations from China soon after the Chinese New Year (February 9). The Indian centre, which is an arm of the US-based Autodesk Inc., popular for AutoCAD Software, has its headquarters in Chennai. CADD Centre India is one of the key players in the CAD/Grafx/PPM product and services operating through a network of nearly 100 franchisee outlets in India. Talking to The Tribune, Mr R. Parthasarathy, Executive Director, CADD Centre India, said after an extensive study they concluded that China held immense potential for training of engineering graduates and postgraduates. The company already has its presence in Malaysia, Bangladesh and Sri Lanka. He was in the city today regarding the launch of two CADD Centres in Chandigarh. The company is bullish on North India with the increase in the number of engineering colleges in Punjab. CADD will open up two more centres at Jalandhar and Amritsar tomorrow and plans to start from Patiala, Faridkot, Ferozepore, Ludhiana, Hoshiarpur and Bathinda very soon. “The course modules are industry-specific and have immediate relevance and use in the industrial world,” says Mr Parthasarthy and adds that CADD courses complement whatever is already being taught in engineering colleges. “We already have a tie-up with many engineering colleges in Punjab, including Beant Singh College, Gurdaspur, and APJ Institute of Architecture in Noida,” he says. CADD Centre is also in talks with various engineering colleges of Chandigarh and vicinity to harness any possibility of a tie-up. The two leaders, senior ministry officials said would discuss measures, including pumping in a large quantity of free sale sugar in the market to offset the rising prices, stringent action against hoarders and converting some quantity of free sugar into less expensive levy sugar. To tide over the situation of a likely drop in sugar production this year, 11 lakh tonnes of raw sugar have already been imported and another 6 to 7 lakh tonnes have been contracted, he officials said. Though sugar output is likely to go down to 120 lakh tonnes this season, buffer stock of 85 lakh tonnes and 15 to 20 lakh tonnes of raw sugar import would supplement the country’s requirements, an official said adding the total availability would touch around 225 lakh tonnes against the domestic requirement of 180 lakh tonnes annually. The white paper will be formally unveiled on January 17. It would contain the structure of the proposed Vat and finer details and procedural matters. For purposes of easier clarification of matters by the trading community, the white paper will be published in English, Hindi and Urdu. The Empowered Committee of State Finance Ministers headed by West Bengal Finance Minister Asim Dasgupta met here today to finalise the white paper. “I am very happy to announce the white paper has been finalised and the Empowered Committee has endorsed it. The white paper will be issued on January 17,” Vat panel Chairman Asim Dasgupta said after the meeting. Mr Dasgupta said the committee held confabulations with national level trade and industry bodies in order to clear doubts on the proposed regime. “We will try to accommodate the views of traders on ground-level difficulties. It is our collective effort to reduce the difficulties,” Mr Dasgupta said. The 21” and 29” TV sets would cost about Rs 13000 and Rs 23,000, about Rs 2,500 more than the normal TV sets. He disclosed that the company was also contemplating to come out with an initial public offering (IPO). He had earlier said the company would like to dilute its equity by 25 per cent after remaining cash positive for three consecutive years. LGEIL has been posting a compound annual growth of 40 per cent and plans to invest about Rs 1,200 crore in the country in the next five years, which is likely to come from internal accruals. LGEIL’s IT and GSM divisions were expected to post 14 per cent and 10 per cent growth this year as against 11 per cent and 3 per cent, respectively, last year, while the consumer durables and household appliance divisions were likely to grow by 36 per cent and 40 pc, respectively. The State Bank of India has contributed Rs 10 crore to the Prime Minister’s Calamity Relief Fund for rehabilitation of tsunami victims. SBI Chairman A K Purwar presented the cheque to Prime Minister Manmohan Singh here, a statement said today. Allahabad Bank has contributed Rs 5 crore to the Prime Minister’s Relief Fund for tsunami victims. Bank’s Chairman and Managing Director O.N. Singh handed over the cheque to Prime Minister Manmohan Singh at New Delhi. National Aluminium Company (Nalco) has contributed Rs 2 crore towards the Prime Minister’s National Relief fund for relief and rehabilitation measures in the areas affected by tsunami disaster. The cheque of Rs 2 crore was handed over to Prime Minister Manmohan Singh by Union Minister of Mines Sis Ram Ola, an official statement said. Reliance Industries CMD Mukesh Ambani yesterday called on Prime Minister Dr Manmohan Singh and donated Rs 5 crore towards the Prime Minister’s National Relief Fund towards relief for those affected in the tsunami tragedy. Metro Cash & Carry India has announced that it would contribute Rs 1.4 crore to the tsunami-affected areas of South India. “The company donates this sum in addition to its continuing involvement of fishermen training and upgradation of port infrastructure in the region. The new contribution has been earmarked for rehabilitation of fishermen and rebuilding of port and harbour infrastructure across the Tsunami-affected regions”, it said in a statement. Hinduja Group flagship and commercial vehicle maker Ashok Leyland has donated a relief amount of Rs 1 crore towards relief operations for the victims of tsunami tragedy. Mr R.J.Shahaney, Chairman and Mr R Seshasayee, Managing Director, Ashok Leyland handed over two cheques amounting to Rs 1.13 crore ( the additional amount being contribution from the employees of the company) to the Tamil Nadu Chief Minister Ms J Jayalalithaa today. The Murugappa Group has contributed Rs 1.06 crore to the Prime Minister’s National Relief Fund to provide relief to the tsunami victims. The Vice-Chairman and Director of the Group, M A Alagappan presented the cheque to the Prime Minister. Except for Gypsy and Omni, which saw an increase of Rs 3,000, all car models—Alto Lxi, Baleno Vxi, Esteem Di and Vxi, Versa Dx2, WagonR Vxi, Zen Di and Vxi—became costlier by Rs 2,000.